” An American photojournalist and a South African teacher held by al-Qaida militants in Yemen have been killed in a failed U.S. rescue attempt, authorities said Saturday. U.S. President Barack Obama said in a statement he ordered the raid that saw Luke Somers and Pierre Korkie killed after al-Qaida in the Arabian Peninsula posted a video online Thursday threatening to kill Somers. ” When Barack Obama introduced himself at the 2004 Democratic National Convention declaring there was only one America – “not a liberal America and a conservative America” and “not a black America and white America” – many instantly envisioned him as a future presidential candidate with a unique heritage and extraordinary rhetorical skills that would enable him to unite a nation divided over political ideology and race. Not long into his presidency, however, it became apparent to many, including some liberals, that Obama’s leadership and policies had only exacerbated the divisions. Most attributed his failures to simple incompetence, but Michael Savage saw something much more sinister happening, and in his new book – “Stop the Coming Civil War” – he charges Obama is deliberately dividing the country. At the time Savage finished the manuscript, several months ago, many continued to mock the provocative notion that any president would purposefully damage the nation. Meanwhile, an increasing number of bewildered Democrats are distancing themselves from Obama. But recent events, including the flood of Central American illegal aliens and the entry of the Ebola virus to the U.S., have made “Stop the Coming Civil War,” Savage’s 30th book, seem prophetic. ” Former U.S. Navy SEAL Carl Higbie is standing by his controversial declaration that 90 percent of America’s military troops do not support President Barack Obama. 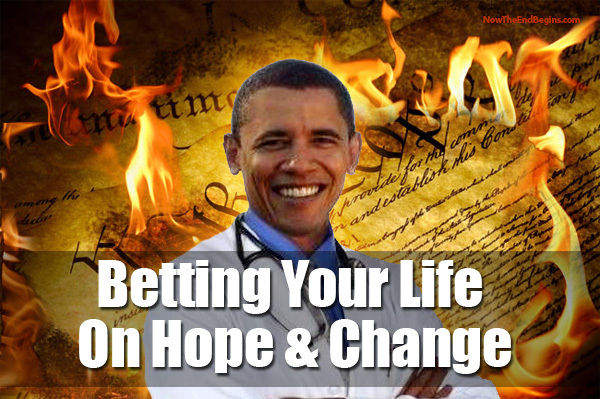 Battleground Poll Shows Obama & Dems Seriously Underwater … Will GOP Throw Them A Lifeline ? If the nation’s economy is on the mend, the voters of 2014 aren’t feeling it. Despite continued signs of a halting but persistent national comeback, midterm voters remain frustrated and unhappy with the state of the economy, according to the latest POLITICO poll of likely voters in 2014 battleground states. Many appear to blame President Barack Obama: 57 percent of these voters disapprove of his economic leadership. But while the economy has improved, it has not yet taken flight: Unemployment remains above 6 percent, and in August the country gained just 142,000 jobs. Candidates around the country have tempered their claims of economic improvement, including Republican governors who also initially aimed to run on their records of job creation. Read it all at Hot Air but remember … if there is a way to blow a huge advantage the GOP are the ones that can find it . ” Barack Obama is apparently very angry with Bibi Netanyahu. If you don’t think that Obama is a serious threat to Israel’s existence consider the fact that Obama , with the use of our tax dollars , helps fund Hamas and their attempts to drive the Israelis into the sea . ” A Fox News exclusive reported this morning by Jana Winter inexplicably buried the lede. Gypsy Rose Lee I Will Not Comply! She took the first pack and jumped out of the plane. The second passenger, John McCain, said, “I’m a Senator, and a decorated war hero from an elite Navy unit from the United States of America.” So he grabbed the second pack and jumped. The third passenger, Barack Obama said, “I am the President of the United States and I am the smartest ever in the history of our country, some even call me the ‘Anointed One. '” So he grabbed the pack next to him and jumped out. Jogging in their dress clothes … yeah , right . What a bunch of idiots . How much did this idiotic video cost the taxpayers ? Be sure to check out the comments on the Youtube page . Some of them are priceless . Watch Obama’s Facebook ‘Looking Back’ Video! ” We were able to hack into Barack Obama’s personal facebook account and get a copy of his “look back” video… you’ll be shocked at what we found! Or not, whatever. Who do you suppose is the wiser individual ? Mr “scholar” we are a Republic , not a democracy ! The Six Worst Presidents From A Libertarian Perspective ? Who Were The Worst US Presidents? There is much to debate here . What of Abraham Lincoln ? FDR ? Lyndon Johnson ? Richard Nixon ? What’s your feeling ? Piers Morgan adorns the right grip on the “Left” pistol . While Barack Obama adorns the left grip of the “Left” pistol . Suitable location that . 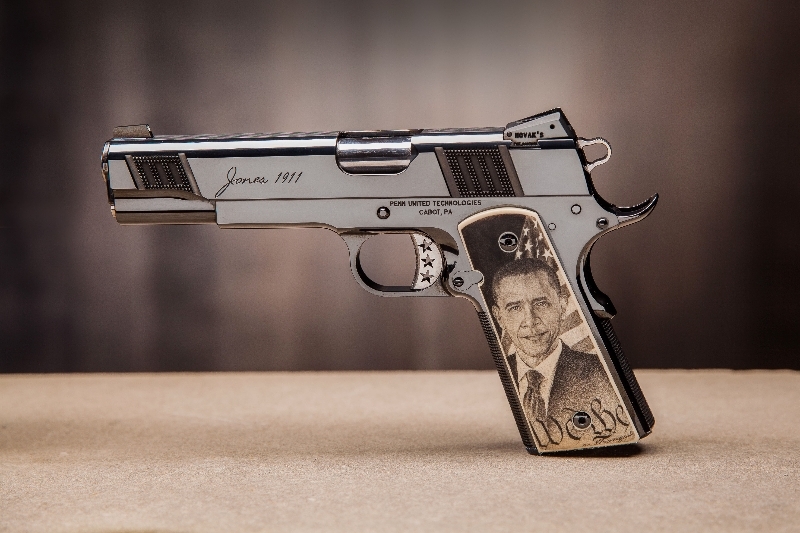 The “Right” pistol is adorned with carvings of Ted Nugent and President Bush . Go here to see all the photos and to read more . 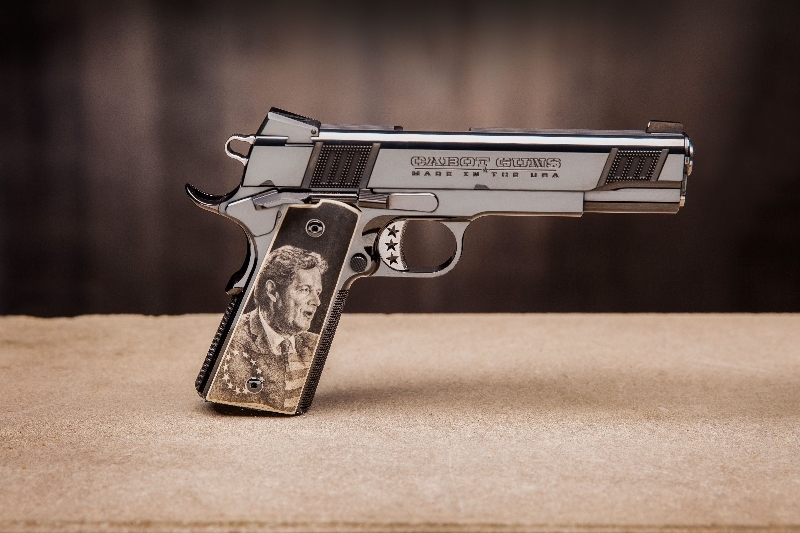 The video below , while not showing the Morgan-Obama set does show the quality of Cabot’s creations with other matched left-right pistol sets . The sets are true mirror image guns with the left-hand gun having all controls , ejection port and even barrel rifling a mirror image of the standard right-handed pistol . Magnificent workmanship . These guns are truly works of art . See more about Cabot Guns here and here but bring your drooling towel . They are awesome creations . Here are a couple entries to sample before you add your own pithy witticism . ” A series of revelations about the rocket believed to have delivered poison sarin gas to a Damascus suburb last summer are challenging American intelligence assumptions about that attack and suggest that the case U.S. officials initially made for retaliatory military action was flawed. ” Fifty years after President Johnson started a $20 trillion taxpayer-funded war on poverty, the overall percentage of impoverished people in the U.S. has declined only slightly and the poor have lost ground under President Obama. ” Although the president often rails against income inequality in America, his policies have had little impact overall on poverty. A record 47 million Americans receive food stamps, about 13 million more than when he took office. ” A federal judge today upheld a President Barack Obama administration policy allowing authorities along the U.S. border to seize and search laptops, smartphones and other electronic devices for any reason. The decision (.pdf) by U.S. District Judge Edward Korman in New York comes as laptops, and now smartphones, have become virtual extensions of ourselves, housing everything from email to instant-message chats to our papers and effects. The American Civil Liberties Union brought the challenge nearly three years ago, claiming U.S. border officials should have reasonable suspicion to search gadgets along the border because of the data they store. 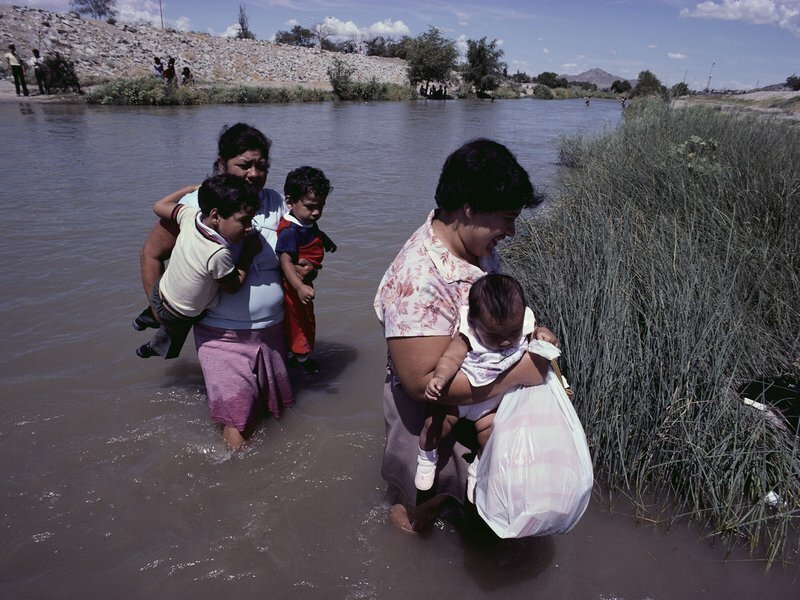 But Judge Korman said the so-called “border exemption,” in which people can be searched for no reason at all along the border, continues to apply in the digital age. This is insanity . This ruling doesn’t just impact travelers . 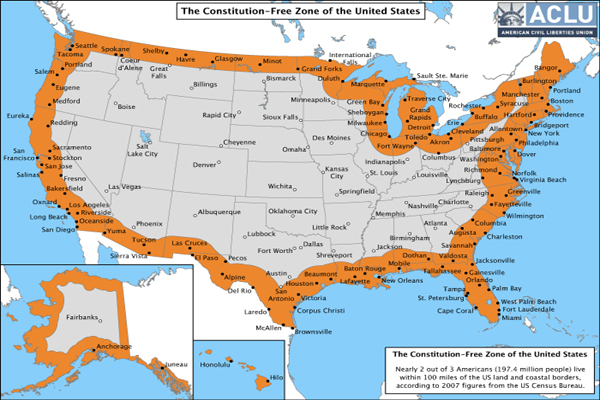 Millions of people live within a hundred miles of the border and now we are supposed to believe that in the name of “national security” their constitutional right to be secure in their papers and effects is forfeit ? The judge should disbarred immediately as he quite obviously is in violation of his oath to “uphold the Constitution” . The Founders are hanging their heads in shame . ” Among President Obama’s formerly greatest champions — minorities, unions, so-called journalists and young voters — the swirling-into-oblivion administration has engendered a remarkable sullen silence, given their loss, as they passively give up on recovering their once-loved gem, now sullied by this government’s own political excrement. 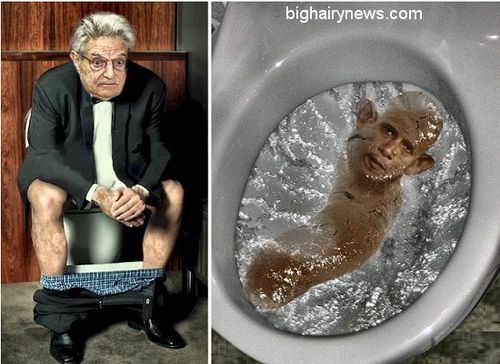 Covered with the stench of debacles including Obamacare, the NSA, Syria, Benghazi, the IRS, and the AP, while demonstrating a level of incompetence so great that it must give pause to all but the most committed members of the cult of unlimited government, few liberals will be willing to dig through the muck to reclaim their once-prized possession. That’s CNN’s take and below is Fox News’ report on this massive collection of new laws being foisted on an unsuspecting citizenry in the name of the Nanny State . ” Obamacare looms large and menacing on our horizon. This is not just because of computer problems, or even because some people who think that they have enrolled may discover at their next visit to a doctor that they do not have any insurance coverage. Obamacare is more than a medical problem, though there are predictable medical problems — and even catastrophes — that will unfold in the course of 2014 and beyond. Our betters have now been empowered to run our lives, with whatever combination of arrogance and incompetence they may have, or however much they lie. The challenges ahead are much clearer than what our responses will be. Perhaps the most hopeful sign is that increasing numbers of people seem to have finally — after nearly five long years — begun to see Barack Obama for what he is, rather than for what he seemed to be, when judged by his image and rhetoric.